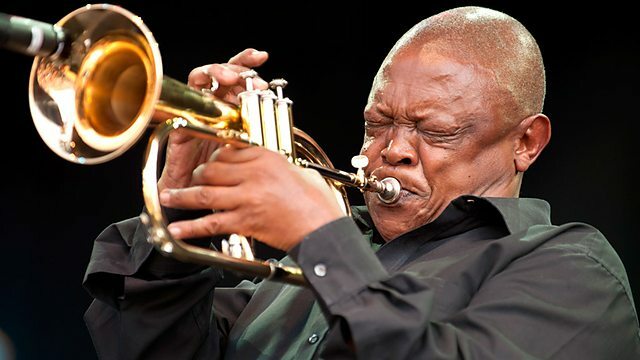 Home / BREAKING NEWS / South African jazz legend Hugh Ramopolo Masekela has died, aged 78. BREAKING: Legendary Jazz musician #HughMasekela has passed away. #RIPHughMasekela. Masekela was born on 4 April1939 in Witbank. As a child, he began playing the piano, but a movie about jazz cornetist Bix Beiderbecke, Young Man with a Horn, inspired him to shift his musical allegiances. Anti-apartheid activist Father Trevor Huddleston helped Masekela to acquire a trumpet and ensured he received tuition, resulting in his rapidly joining South Africa’s first youth orchestra, the Huddleston Jazz Band. In the late 50s, Masekela joined up with Dollar Brand (later known as Abdullah Ibrahim), Kippie Moeketsi, Jonas Gwangwa, Johnny Gertze and alternately Early Mabuza or Makaya Ntshoko on drums, to form The Jazz Epistles, who regularly performed at the Odin Theatre in Sophiatown. In 1959, Masekela joined the cast of Todd Matshikiza's "all-African jazz opera" King Kong. The musical, which also helped launch the career of Miriam Makeba, received permission to perform in London in 1961. With the Sharpeville massacre in mind and with jazz being seen as an expression of resistance, performances and broadcasts in South Africa were severely restricted. Masekela took the opportunity, along with many other members of the cast, to remain in England, effectively going into exile, and enrolled at the London Guildhall School of Music, later moving to the Manhattan School of Music in New York. Here he befriended musician and political activist Harry Belafonte, and his music increasingly began reflecting the harsh realities of repression and discrimination back home. Masekela had success in the United States with a pop-jazz tune, "Up, Up and Away", in 1967. In 1970, he toured Guinea with Miriam Makeba and met Nigerian AfroBeat musician Fela Kuti and the Ghanian band Hedzoleh Soundz. This led to his breakthrough album "Introducing Hedzoleh Soundz", one of the most highly regarded Afro-jazz albums of the decade. Masekela performed on recordings by the Byrds, made an album in 1978 with trumpeter and bandleader Herb Alpert, and later collaborated with Paul Simon. Masekela performed with Paul Simon on the 1987 Graceland tour, along with Ladysmith Black Mambazo. Of the tour opener in Rotterdam, Rolling Stone magazine reported: "Special guest star Hugh Masekela, the exiled South African trumpeter, called for the release of imprisoned African National Congress leader Nelson Mandela in his jazz-funk anthem 'Bring Him Back Home', while singer Miriam Makeba, a fellow exile, lamented the suffering and repression in her homeland with a soulful torching of Masekela's 'Soweto Blues'." "Soweto Blues" was written by Masekela in response to the Soweto riots of 1976 and the carnage that followed. Masekela later defended Simon after the tour was criticised as being in violation of the ANC's cultural boycott. His 1987 hit "Bring Him Back Home" subsequently became the theme tune for Nelson Mandela's world tour after his release from prison. Masekela's output in Botswana increasingly shifted to jazz-funk and included "Techno-Bush". Masekela produced music for the Mbongeni Ngema musical Sarafina and was also featured in Lee Hirsch's 2003 documentary Amandla! : A Revolution in Four-Part Harmony. He continued to perform regularly, hosting "Hugh Masekela & Friends Live in Concert" at Montecasino, Johannesburg in 2010, two concerts that in many ways served as an epitaph to his career. Masekela received numerous awards throughout his life, among them the Order of Ikhamanga - South African National Orders Ceremony (2010); an honorary Doctorate in Music from the University of York (2014); a Doctor of Music (honoris causa) from Rhodes University (2015); and the African Music Legend Award - Ghana Music Awards (2007). Masekela is survived by his wife, Elinam Cofie, whom he married in 1999 and for whom he penned the song "Ghana", his daughter, Pula Twala, and his son, Selema "Sal" Masekela, from his relationship with Haitian Jessie Marie Lapierre.